Ottawa Fury FC announced Wednesday the signing of Canadian International Kyle Porter. The versatile forward/defender brings NASL and MLS experience to the Canada’s capital and joins Fury FC from the Atlanta Silverbacks. Porter, 25, is a versatile player that will be a threat for Fury FC on the right side providing the club with ample depth at several positions this season. 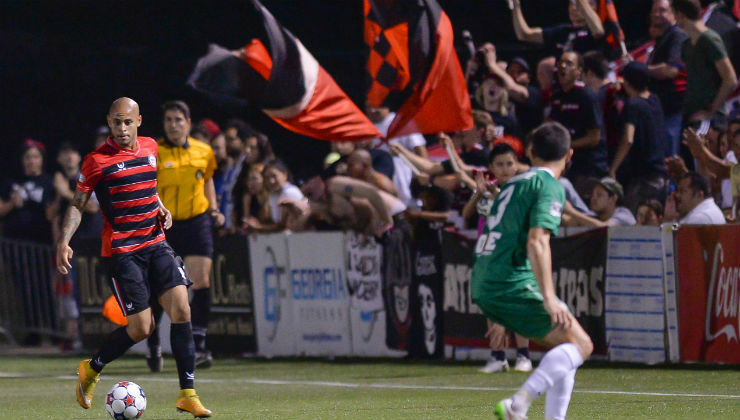 The 2016 season will mark Porter’s fourth season in the NASL having spent 2011 and 2012 with FC Edmonton and the 2015 campaign with the Atlanta Silverbacks. In total, Porter has tallied 14 goals and one assist in 77 career NASL matches logging over 5,564 minutes. No Canadian player logged more minutes in the NASL in 2015 than Kyle Porter. The native of Toronto, Ontario. Porter made his Canadian men’s national team debut against Denmark in 2013 and a month later made the jump to MLS signing with DC United. He became a key piece in the Black-and-Red’s midfield and featured in 27 matches, scoring three times – all game-tying goals. He has featured seven times for the national team and has also represented Canada at the U-17 and U-20 levels. Porter developed in the Whitecaps Residency program between 2007-2010 and also spent time on loan in Germany with FC Energie Cottbus featuring in both their U-19 and U-23 sides. As of today, Fury FC have six Canadians in their squad – goalkeeper Marcel DeBellis; defenders Mason Trafford and Kyle Porter; midfielders Julian de Guzman and Mauro Eustaquio; and forward Carl Haworth.